I’ve been bird watching for a little over six months. I’ve been writing small town romance for five years. How do they tie in? What I love most about small town life is the feeling that everything you need or want is right there in town, in your own backyard so to speak. I was talking to someone about my bird watching hobby recently, and she remarked how she didn’t have time to travel to exotic places to see different kinds of birds. I decided to blog about my bird watching to show anyone interested that you can enjoy the birds right in your own backyard. Today I’m going to talk about woodpeckers. According to my collection of birding books (I’ll share them for you as a resource so you can check them out), there are at least sixteen types of woodpeckers in North America. With that number in mind, I’m almost certain you’re bound to find at least one of them in your own backyard. 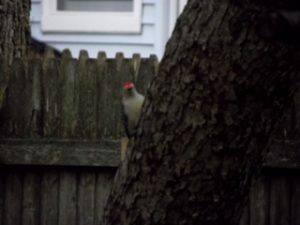 But before we go right to talking about the woodpeckers in my backyard, let’s talk about how you can get started bird watching in your backyard. When I started I had a pair of five dollar binoculars I had found in my local drugstore. I also had my iPhone, since I wanted to be able to take pictures of whatever I saw. I hadn’t yet bought any books, so I was going on good faith that I would be spotting something. I also didn’t know how I would know what bird was what. Of course, there are those birds that we all see everyday wherever it is we live. In my part of New York, it’s not unusual to see robins in the spring and cardinals in the winter. I decided I would keep a small notebook and write down the date and whatever birds I saw that day. What I have learned is that beyond a pair of binoculars, a phone for pictures, and something to write your birds down on, what a bird watcher needs more than anything is discipline. I stepped out in my yard and expected it to come alive with birds. I was expecting I’d sit there and snap picture after picture of whatever I saw. Hmm. Not so much. Sure, there will always be sparrows hanging around the forsythia bushes. There will always be a dove or a robin landing on the edge of the pool here and there. But if I wanted to see more birds, I needed to sit there quietly and wait. After a few days I found myself getting pretty good at sitting on the back steps and waiting quietly for the birds to come. But even that wasn’t quite enough to lure anything new to me to my yard. It didn’t take long to figure out that if I wanted to get something I had to give something. And that something was seeds. Within a week, I had three bird feeders strategically placed in my yard, one by the vegetable garden and two hanging at different spots under the big crab apple tree. The bird I’m sharing on this very first Wednesday Bird Watch is the woodpecker. As I said, there are at least sixteen types of woodpeckers in North America. I didn’t expect to find more than one in my backyard, so I was pleased when I found two. The Red Belly Woodpecker is named for the hard to see red patch on its lower belly. 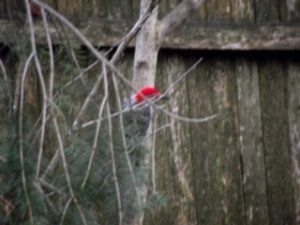 Personally, I would have named him the red headed woodpecker since he sure has a bright patch of red on his head. And that’s how I learned to identify him. Another common tell tale sign that you’re looking at a red belly woodpecker is the black and white zebra striped feathers on his back. My daughter pointed out that the orange marking on his face reminded her of a clown, fitting for such a comical little bird who flits from feeder to tree. The woodpecker is one of the few birds that can run up the tree rather than just fly. Though most of my books state the red belly is most common in the forests, this fellow has been a regular at my feeders every day from the beginning. If you’ve ever heard a rather loud tapping while outside in your yard, more than likely it was a woodpecker doing what woodpeckers do best – picking insects from the bark of the trees. The woodpecker literally drills into trees to remove the beetle larvae from it. 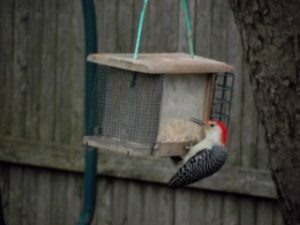 Aside from that, I learned that the red belly woodpecker also enjoys seeds. This one frequents each of my three feeders and enjoys the wild bird seed I fill them with. In addition, I’ve taken to putting peanuts, unsalted and in the shell, down on the ground to see which birds might enjoy them. I was thrilled to be able to watch as the red belly swooped down, picked up the peanut in his beak, and flew up into a neighboring tree to feast on it. Seeing how he was such a regular in my yard, I decided to name this fellow Waldorf. Then one day I spotted Waldorf looking a little different. There was a flash of red, but something was different. Then it hit me. Though this bird had the mannerisms of a woodpecker and looked like one, it wasn’t Waldorf. How thrilled I was when I found out I had another woodpecker visiting my feeders. With a little research and checking my bird books, I soon figured out this woodpecker was called a Downy. The downy woodpecker is several inches smaller than the red belly. The red belly is a little over nine inches in length; the downy a petite six and three quarters inches. Petite is the perfect word to describe the downy woodpecker. The downy woodpecker is the smallest woodpecker in North America. Its size enables the woodpecker to hang onto goldenrod stems where it gets its first choice of food, fly larvae. Like the red belly woodpecker, a vibrant red patch at the back of its head, on the male only, makes it distinguishable from other birds. Unlike the red belly woodpecker, its bill is quite short. Unlike the red belly, it has soft downy feathers on its lower back and that is how it was named the downy woodpecker. Despite its small size, the males are known to chase the females from tree tops, forcing the females to feed at a lower spot in the tree. Though they get their meals in the treetops, the downy woodpecker is a fairly common sight at backyard feeders. Now that I know to look for these two woodpeckers at my feeders, I’m happy to find both of them feeding at the feeders every mornings. Seeing those flashes of red brighten up an otherwise colorless, dull winter morning and I look forward to spotting them each morning. Unfortunately, I have several good pictures of the red belly woodpecker, but have only gotten one of the downy woodpecker. 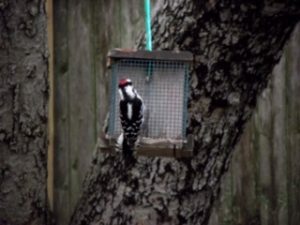 Maybe his small size makes him a bit more skittish than the larger red belly woodpecker? I hope you’ve enjoyed visiting with the woodpeckers in my backyard. Here are a few pictures that I’ve taken so you can meet them yourself. I hope you’ll stop by next week for Wednesday Bird Watch for a visit with another beautiful bird at my feeders. Enjoy the rest of your week!